Only to find I was out of lightweight fusible interfacing. Grrr. Save 30% on all holiday fabrics with code JULY25. Now through Saturday the 28th. What a deal! These are some of my favs. Ok, so I ordered some interfacing, waited for it to arrive and started again. Applied interfacing to the skirt yokes. Then I realized the skirt was looking too small. In fact, it looked like it was going to turn out many sizes smaller than the version of the skirt that I currently wear and love! Namely, this yellow number in voile. 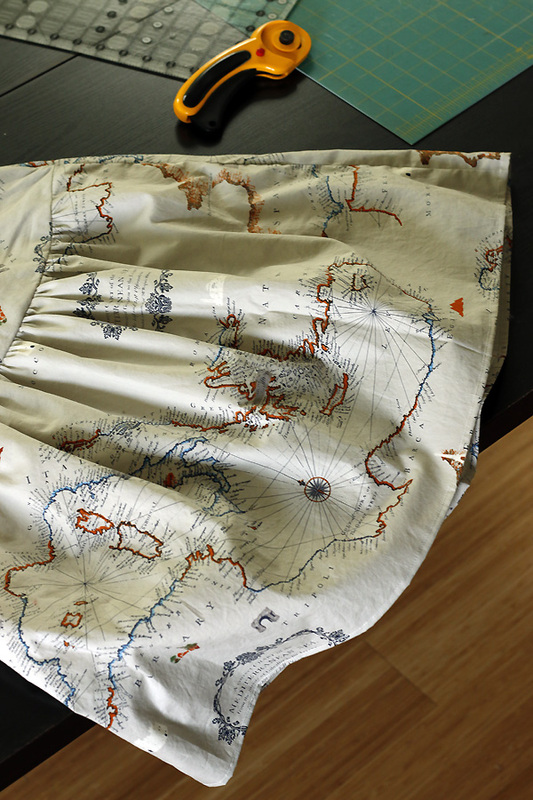 Even after removing the waited-for interfacing, my Cartographe skirt is decidedly small. Apparently, I needed a larger size, which I'm sure I would have realized if I measured instead of making the size I'd made before. But, alas, the fabric had been cut and sewn and mostly finished. And now it's totally finished. I had so very much wanted to wear this pretty map fabric, but it's not yet to be. Instead, it shall hang in my closet, a reminder to be faithful to my new exercise regime. I can't pretend that I'm not enormously frustrated, but that's life. Also, that's clothes. Quilts almost always fit. Just sayin.